We are looking for bright, energetic, people-oriented team members who love to teach their knowledge to join our staff. Veterinarians, new graduates or experienced, animal technicians, assistants and customer service representatives, as well as people experienced with grooming and boarding are welcome to apply. Deep intramuscular injection in the epaxial (lumbar) muscles in the third through the fifth lumbar region. DO NOT ADMINISTER AT ANY OTHER SITE. Avoid any superficial injection or leakage. Use a 23 ga needle that is 1 inch long for dogs less than 20 lbs. Use a 22ga needle that is 1.5 inches long for larger dogs. Use alternating sides with each administration. Record the location of the first injection in the medical record for future reference. Inject twice (see Figure 1)— 24 hours apart using alternate sides for injection. May repeat in 4 months if necessary. Alternate Dosing Regimen (see Figure 1)— Administer a single injection as directed; Followed in 30 days by two injections on alternate sides given 24 hours apart. 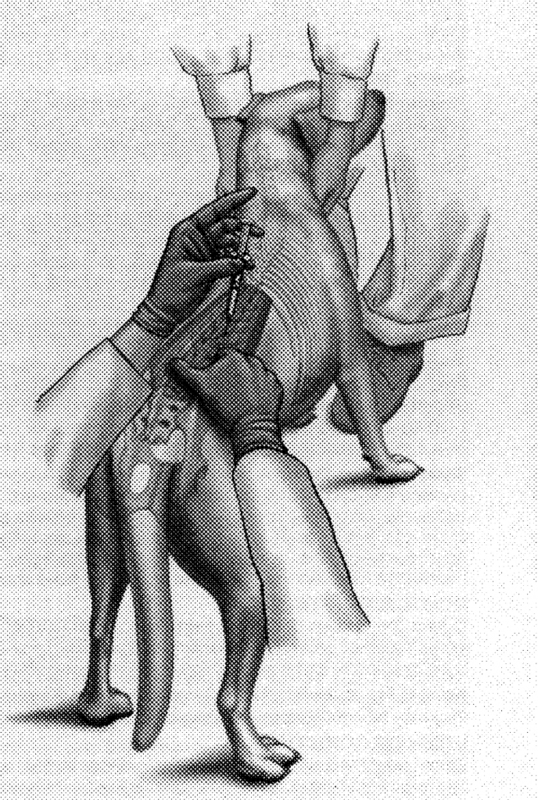 Figure 1 Administration of Immiticide – Deep insertion of clean needle into the epaxial muscles. The second shot is given on the opposite side. Note; Excellent restraint is necessary. Caparsolate which has been used for the past 40 years for heartworm treatments is being replaced by melarsomine (Immiticide). The amount of arsenic in this compound is not enough to cause toxicity in the dog. It is used at 1 ml per 10 pounds body weight. The injection is given by the following schedule: Give the first of four injections intravenously through the catheter at 8:00 a.m.; give the second injection 6 to 8 hours later; the third injection is given 14 to 16 hours later followed by the fourth injection 6 to 8 hours after the third. Heparinized saline is injected into the catheter to insure proper placement and patency. This flush is done before and after each Caparsolate injection. Heparinized saline has been shown to reduce the reaction of the vein to the Caparsolate. The injections should be given shortly after a meal to reduce vomiting or intestinal upsets. Day One after Pre-treatment Evaluation: Give two injections of Caparsolate 6 to 8 hours apart. Day Two after Pre-treatment Evaluation: Give two injections of Caparsolate starting 14 to 16 hours from previous injection and spaced 6 to 8 hours apart. Day Three after Pre-treatment Evaluation: Observation for adverse reactions. Strict confinement to a crate, small room or pen is necessary. Walking is done only on a leash and only for long enough to urinate or defecate. Acepromazine tranquilizers are prescribed as needed for sedation. Ascriptin at 5 mg / lb is given twice daily until treatment is completed. The pet should eat low salt food and not be fed table scraps or any treats. Hill’s Prescription Diet H/D® diet is recommended. Use Hill’s Prescription Diet Feline H/D® diet if the pet will not eat the canine version. Complications of the therapy include extravasation of Caparsolate into the tissues around the vein. This causes a severe reaction and the infiltrated area may slough a considerable amount of skin and muscle tissue requiring skin grafts in severe cases. It is imperative that the patency of the catheter be certain prior to injection. Never inject Caparsolate into a leg that is warm to the touch or painful. Should extravasation occur, inject large quantities of lactated ringers or saline solution into the tissues around the area of extravasation. Add 3 cc of DMSO and 5 cc of dexamethasone or Solu- Delta Cortef to the lactated ringers solution to be injected subcutaneously to further reduce tissue reaction. Vomiting or diarrhea may occur at this time and are not reasons to stop the treatment. Place the dog on I.V. fluids and continue the treatment. Be sure to feed just prior to the injections to reduce this reaction. The development of jaundice or icterus is a concern. If this occurs; the heartworm treatment is stopped for 14 days and then the injections are re-instituted at the start. This time period will allow the development of liver enzymes to help the dog adjust to the medication without toxicity. The second try at therapy is usually without problems. Continue the aspirin during this cessation of therapy. Acute severe thromboembolism (blood clots and dead heartworm clots in the major vessels of the lungs) is the most dangerous complication. It is first evidenced by lack of appetite followed by pale gums, rapid shallow respiration, abnormal heart sounds, coughing, or coughing up blood, weakness and vomiting. These signs are followed by blood neutrophilia and fever. The treatment is varied but may include prednisolone, furosemide, heparin, and oxygen. Hospitalization is usually required. Additional costs are incurred if this occurs. The client should be made aware of this at the outset of the therapy. All emergency and professional services are waved of charge but tests and medications are charged at full value. Most cases of thromboembolism can be managed with attention to detail and time. After the pet is sent home from a routine heartworm treatment, recheck visits are made on a weekly basis for the next 5 weeks. The first, second, and third visit are routine T.P.R. and determination of client compliance with instructions. Assuming the pet is having minimum difficulty with the treatment and not having gastrointestinal upsets with the Ascriptin® then nothing is changed. On the fourth weekly visit post adulticide (drug to kill adults) administration, a microfilaricide (drug to kill microfilaria) is given. The microfilaricide is ivermectin is given at 200micrograms per kilogram (.1 cc per 40 lb.). The microfilaria should be killed within a few days. Adverse reactions to the ivermectin are possible and will usually occur within three hours of administration. These reactions are due to the death of large numbers of microfilaria. The dead microfilaria can cause an allergic shock like reaction in some dogs. Administration of corticosteroids has been shown to reduce this reaction. Strict confinement is maintained for the entire six weeks post adulticide therapy. On the fifth weekly visit a filter test for microfilaria is performed. If negative the pet is placed on heartworm preventative. If microfilaria are persistent then an additional injection of ivermectin is given and a sixth weekly visit is scheduled. Two months after the fifth visit another appointment is scheduled. At this appointment the occult heartworm test is performed. If the pet is negative then all heartworms were killed. If the occult heartworm test is positive, then young female heartworms must have not been killed. These heartworms are allowed to mature for six months and the injections are repeated. Aspirin therapy and heartworm preventative are continued during this waiting period. Three months after the treatment is done the occult heartworm test is repeated. *Groomers arrive early for boarded pets checking out Sunday afternoon. Enter your e-mail address for updates, pet care tips, and special offers.